Harken is celebrating 50 years in business this year, and is offering a unique twist on their traditional 57mm blocks by adding a bit of color: bright red sheaves. 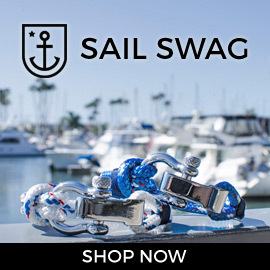 you can find them at various Harken dealers and of course at APS. you can enter for a chance to win a 57mm carbo ratchet block from the Harken blockheads here. I was just browsing online for some new rigging to get for the Minifish that I bought in November, and came across a nice little video that Annapolis Performance Sailing just created that talks about the Harken H150 cam cleat and some of the accessories you can pair with the H150. the H150 is a great little cam cleat that I have used before with my Sunfish if I want the option to cleat the mainsheet. 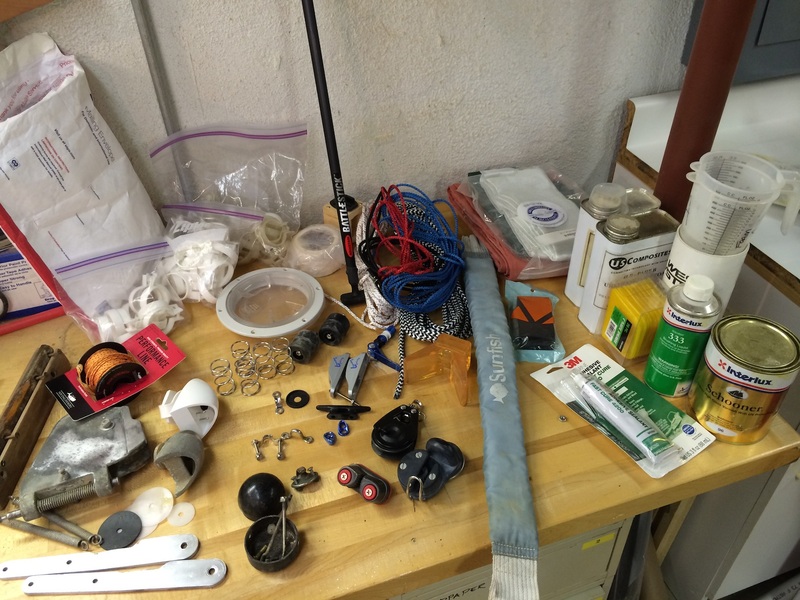 my setup includes a Harken carbo ratcheting block – the 57mm H2135 on a stand-up spring – that controls the tension on the mainsheet. I mounted the H150 cam cleat on the turned down lip around the cockpit of the Sunfish. the picture below is before I installed the stand-up spring, but shows the H150 mounted on the cockpit lip. 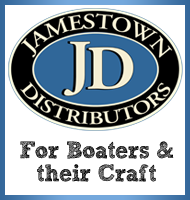 this position is important for a few reasons: it keeps the cam cleat mostly out of the way, and it makes it fairly difficult to reach that far into the middle of the boat to cleat off the mainsheet when you are hiked out in a stiff breeze. 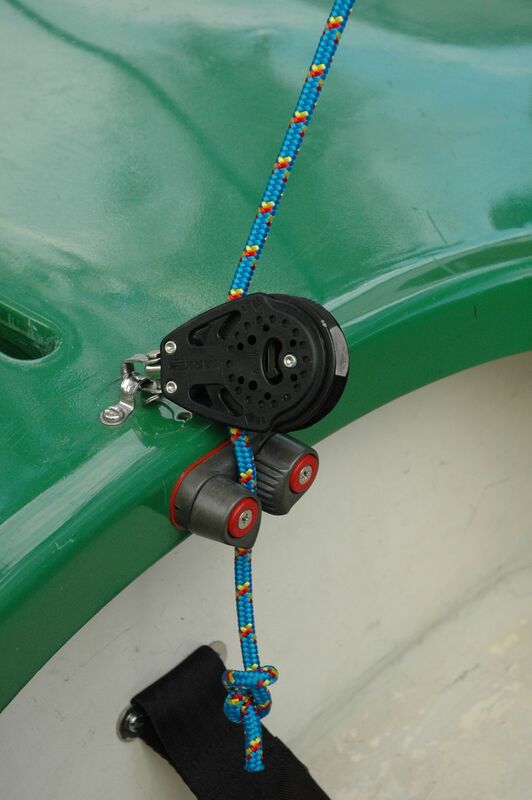 some sailors/racers like to install a cleat on each side of the cockpit near the outer edge of the Sunfish, but these can hurt your legs if you ever are hiked out and forward enough that they get in the way. 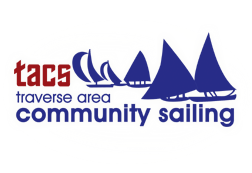 the reason to avoid cleating off your mainsheet in a medium to high strength winds is that you lose the ability to quickly spill the sails if you are hit with a quick puff of breeze. it is recommended to learn to sail with the mainsheet always in your hand, controlling the sail and making minor adjustments with the wind. if you were hit with a large gust of wind with the mainsheet cleated, it could cause you to flip your Sunfish and take an impromptu swim! a note for newer Sunfish with the rolled gunwales – the cockpit trim makes it difficult to install the H150 on the cockpit lip. you might be able to figure something out, but with my newer Sunfish, I just installed the H2135 and the standup spring, and skipped the cam cleat. either option works! last summer, I upgraded from a swiveling fairlead and cleat to a ratcheting carbo block for my mainsheet. 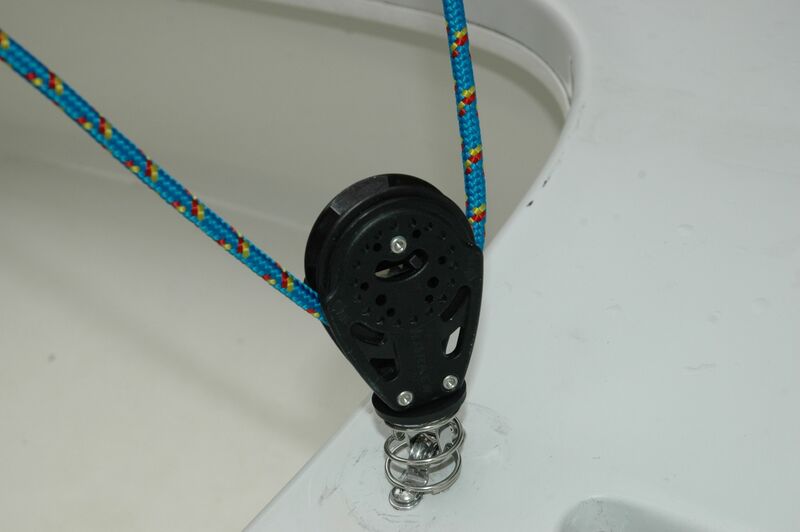 the ratcheting carbo block (a Harken 2135) was/is a nice improvement – I like how the grooved edges of the sheave in the block grip the rope to ease the tension my hands/arms see from the sail pulling on the mainsheet. I haven’t installed a cam cleat on the cockpit lip of my new Sunfish yet, though – the plastic trim on the cockpit lip is sort of in the way, so I haven’t decided what to do there yet. but, a few weeks ago I followed the advice of some posters from the Sunfish Forum, and used (2) zip-ties to slowly compress the stand-up spring (a Harken 071) so that I could install the ratchet block. 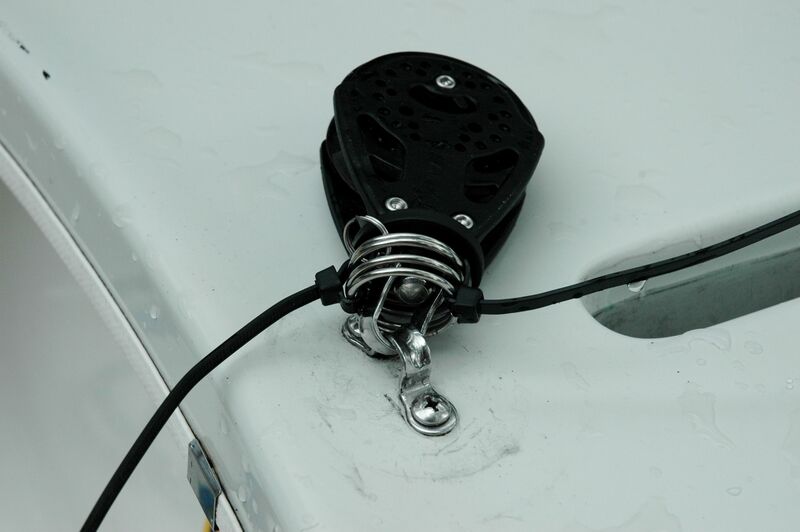 I also installed a spring cup (Harken HSB2) – which sits above the spring, and just below the base of the block. it’s about $2 for both the spring and spring cup, so a cheap upgrade. for my sail on walled lake last week, I got to test out the ratchet block with the stand-up spring, and I must say – I am a big fan. it works just fine, and will automatically rotate with the mainsheet when I change tacks. there are a few times with really light wind where I’ll have to reach up and twist the block to the right direction, but overall it performed adequately. I just wish I had installed the stand-up spring earlier now, as it keeps the block from flopping around and scratching up the surface of the deck.